For decades, Tojiro knives have served as a gateway into the world of high end Japanese cutlery for professional and home cooks alike. In the DP series, Tojiro’s excellent treatment of VG-10 core steel provides for extreme keenness without sacrificing edge integrity or retention. The core steel is laminated with softer stainless steel which enhances the ease at which the knife can be sharpened and provides an element of support and ductility to the harder core. These qualities, in concert with nice convex grinds which aid in food separation and a high level of fit and finish, make the Tojiro DP series regarded as one of the best values available in the knife world today. This gyuto in 210mm format is a heavier middleweight knife by Japanese standards though substantially lighter than many Western equivalents. The edge profile performs well through most cutting styles including rocking, push and pull cutting, and slicing. Being a touch longer than 210mm, this knife will be a wonderful transition for those used to working with 8"-9" Western chef knives and will be capable of handling all but the very largest ingredients. First time purchasing a Japanese knife, and it's wonderful. Definitely would purchase again. This knife is great for around the kitchen at home. Very satisfied with this purchase. First chef's knife I ever bought. The knife is excellent and the service is beyond excellent. I was having problems with the postage, emailed them and within an hour they had emailed me back. Brillant company to deal with. Thank you !! I am a home cook but I have been cooking for 20 years and am always looking to improve my techniques and my tools. This knife was a replacement for a Henckels I got as a gift years ago and I can't believe the difference in experience between the two. I love it and it just feels much more dexterous and capable. I was also very happy with the wealth of info here at ChefKnivesToGo and the shipping was quick as well. The look is wonderful for this knife. It is well balanced, beautiful shape and holding it feels natural. I love this knife. Very sharp, great, smooth design. Handle is well made and smooth. This is the first time I thought it was worth leaving a review for a product. The knife was exactly what it was advertised to be; a sharp knife that holds it's edge for a great price. I strongly recommend this knife for any home cooks who want something relatively light yet still cuts vegetables like butter.CKTG had it delivered to me the same week and also had a little thank you note in the package, which I appreciated. I will definitely buy from them again. Out of the box this knife is good, even great for a home cook, but where this knife shines is on the line in a commercial kitchen. A trip to the sharpening stones for a little thinning and a great edge, and you have a knife that dances circles around Wusthofs that cost three times as much. As an added benefit it is inexpensive enough that you don't have to worry about a ham handed coworker beating the snot out of it, but high enough quality and well enough heat treated to easily stand up to hard use without rolling the edge. The only thing that everyone will want to do is sand down the choil and the spine a little so they are less sharp when holding it in a pinch grip. Balance is right at the bolster so the knife feels incredibly nimble for it's weight, If you are on the edge about getting into Japanese cutlery, this is a logical step. You get the gyuto blade shape, with a more chop/push cutting profile, you get a thin blade that goes through produce like its not even there, a nice convex grind, and it costs less than half as much as a Shun made from the same steel. I have owned this knife for more than 8 years and I can say without a doubt that it is my favourite, it has never let me down despite the abuse I have given it. Although I own knives 3 or 4 times the price of this one, it still is the most pleasant to use.It is quite easy to sharpen on water stones and strops, and will keep its edge unusually long (due to the VG-10 steel which is usually only found in knives 3 times the price) i.e. I need to sharpen it every 3 months but that is with 10 hours of use, 5-6 days a week in a commercial setting (and I re-sharpen when I can no longer get a shaving edge after stropping only).Once you get used to the size you can do everything with it, it truly is a universal knife. From fine paring work (no need for a paring knife if your hands are big enough) to heavy veg prep work to butchering and filleting, it never has an issue.The fit and finish is great for the price point; it is shaving sharp out of the box and the box itself lasted a quite few years of daily use before it disintegrated (which is quite a lot for a cardboard display box). The service from CKTG is the best I have ever dealt with, from any online store bar none.Although I have retired from commercial cooking, this knife is a dream in the home kitchen and very few people would find its size a limitation. There is a reason why it is loved by so many, so if you are hesitant I hope my opinions sway you in the right direction. You wont be disappointed. (Especially if you are an apprentice purchasing their first knife, I highly recommend avoiding the victorinox chefs knife as they are a true pain to sharpen, dont hold their edge and just dont feel as nice in the hand, whilst being only slightly cheaper. Once you see the light, you will never go back). Looks great, streamlined and sharp. One of the best dollar for dollar knives out there. Out of the box sharp, hold and edge well, sharpens well, light enough for smaller hands and chefs. I get this knife for people learning proper knife skills for the first time, but who really enjoy cooking and do it often. Sometimes I get the paring knife/chef knife combo as well. This is the best knife I have purchased. For the price, it's great! You could ease the edges a little with sandpaper, but that's easy enough. It's not the thinnest behind the edge, but that adds to durability. Stainless makes it easy to care for. The handle is comfortable. Just a great general knife to keep around or one to get your feet wet. I keep mine around for when guests stop by and want to use a knife, but I don't want to hand them my handmade blades, ha. 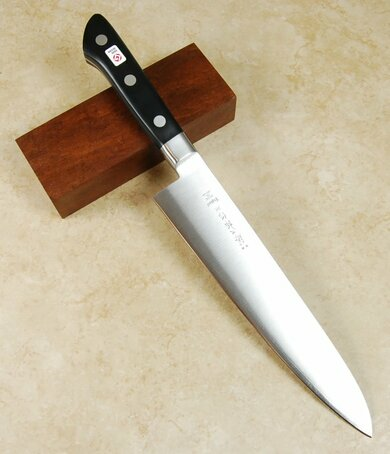 I'm not sure how Tojiro can turn out a knife that is this good at this price. Excellent value. Now that I have a few weeks of using this knife I have to say it is a great starter knife. It's my first chef knife and it chops onions, carrots and other veggies beautiful. It's a true pleasure to use. It's also not heavy so less hand fatigue. I recommend for a starter knife. By far one of the best beginner knives for home use or pro kitchen. Great knife. We actually bought a second so we wouldn't have to fight over it. I've purchased a few of these knives Now for professional chefs in my area. They absolutely love them. They have a great out of the box edge, they are easy to sharpen and hold their edge too. The price is fantastic. Can't get over how much I enjoy these knives,they are comfortable, very nicely made and also come in a pretty nifty box. I will definitely be ordering more in the future. As always, the service is top notch. My first serious knife and still a favorite. This is a great all-around knife - not too heavy, given the western handle, well-balanced, and fairly nimble in the hand. This is still a go-to knife for me when I'm very busy and don't feel like worrying over my more expensive carbon knife. I sharpen knives a lot and I have an obsession with sharpening which has led to a burning desire to have a good knife. I decided upon the Tojiro DP after discussing the product with Mark. I have never ordered a knife online so I was a bit apprehensive. I have seen many very sharp knives, I'm familiar with a nice edge so I expected to have to sharpen the knife when I got it. I was completely blown away by the edge as I received it. It is absolutely terrific, the knife looks great as well, the box it came in is even top notch. After having the opportunity to use the knife I'm extremely pleased and I've already ordered more as gifts. The price is right, it will be easy to sharpen and as always, when dealing with Mark and Sue I got Executive Service, I'm a happy man. Money well spent! This knife is sharp OTB, very easy to use, and has a very clean look. No complaints whatsoever. If you are looking to buy a simple prep knife and are on a budget, this is the one to get. Thanks CKTG! my first good knife. i have nothing to compare it to but i love it. i cook more just to use the knife. i just need to be more careful with it since i cut myself a few times with out even knowing i did. i use this knife for every cutting chore in the kitchen. buy it!!! Got this knife for my father and a couple weeks later, most of his other knives (a drawer full of them) were gone. He told me that the other knives were in the way. 4 words: i love this knife!!!! This is the best knife I have ever worked with. I hope I can keep the edge & keep it sharp! This is a must buy! Best starter knife! This knife just makes life easier at work and at home!I work in a high volume production kitchen and had always dreaded having to cut chicken with our stock knives. I had been wanting a good knife for home use anyway and my Exec Chef told me only Japanese and I am glad he did! With a little research I feel I got the best bang for the buck! I use this at work and at home on my third week and darn that blade is still sharp....Oh yeah cutting chicken at work is kind of fun now I can cut it thinner, faster and the cuts are so much cleaner...OOPS forgot to mention the knife is so light (yet balanced) I feel a lot less fatigued!My Exec Chef is so impressed with it he says he will probably buy one and he owns knives costing 4 or 5 times more than this! This is a fantastic knife for the price! I'm new to Japanese knives, and the edge retention as well as the out of the box sharpness exceed expectations. This is the first knife that my wife and I grab, so I guess I'll have to get another to avoid conflict! Do not hesitate to grab this gem. A really top quality product - my husband is constantly looking for recipes that require any kind of slicing or dicing. It's so sharp it slices equally well through a firm potato or very ripe tomato. This knife is an incredible value! Extremely sharp right out of the box. Very nice finish for a knife at this price point. Great knife, incredibly sharp out of the box. Balance is great. I'm not sure if this is the norm, but my Tojiro was a bit dull - to the point where it squishes tomatoes. Some sharpening has helped. Other than the edge, I am happy, especially with the fast shipping and great packing. I own a knife sharpening business so I see and handle LOTS of knives. Of course, I USE them as well. The value of the Tojiro DP's just cannot be beat. These are light, sharp, beautiful knives at a price that makes them affordable for anyone who is serious about cooking. I expect that in years to come, this three-ply design will be a standard in kitchens around the world. The VG-10 steel center ply with a Rockwell hardness of 60 ensures that they will stay very sharp for a long, long time. Although a number of Japanese mfrs produce this style of knives, the Tojiro DP line is the value leader. Mark,My dad loved the knife! It was exactly what he wanted. The price was very competitive. shipped quick. I would recommend you. My first real chef knife, and I couldn't be happier. I've been using it for about a year and a sharpening steel has been enough to bring the edge back every day. Great knive, The finish could have been better but for this price unbeatable. its now my workhorse in the kitchen. The shipping on mark's side was excellent. I ordered it on monday, it was in the netherlands on friday. To bad stupid netherlands customs took 4 days to process it and they charged me 25 bucks import costs. But with the shipping and Import costs still a great buy and a fair price :) to bad i don't live in the usa, i would have gone s/chopping crazy!thank you CKTG! Got one of these for one of my cooks. I was blown away by the value! This knife is the best deal on the net! Fit and finish are both far better than I expected. It handles well and the blade is quite sharp with good edge retention. Id give it four stars for quality and another for value! REALLY NICE.MY FIRST REAL KNIVE.I BOUGHT AMERICAN-LAMPSON SHARP. THEY ARE CRAP COMPARED TO THIS !THANKS MARK FOR YOUR INTEGRITY. Impressively sharp, right out of the box. Still getting used to it. Not as much rocker from the tip to the heel, as with my german knife. Sort of a long flat section from the heel to middle of the knife (or it's just a much more gradual curve), so it's almost like a nakiri combined with a chef's knife in some ways. 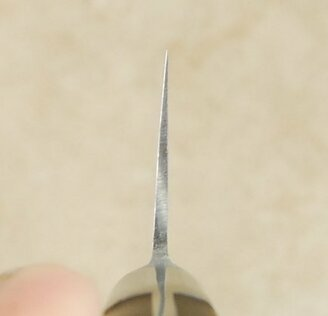 If you tend to point with your index finger on top of the blade, rather then pinch, the square edges on top of the blade are still sharp enough to cause discomfort, but not actually cut you. I have a tendency to hold the knife further down on the handle, so I have to consciously choke up on my grip so I'm putting more downward force with my palm, rather than with my fingers pinching the blade, or else the top of the blade tends to rub my index finger raw. Looking forward to getting more of the Tojiro knives. worth every penny, balance is spot on. sharp as the shun classic i just bought. Got this and the pairing knife combo set. These are my first good knives. The feel excellent, well balanced, sharp right out of the box. When I was shopping I handled the Shun's, the Wusthof and a few others that I read recommendations for and these were def. the best bang for the buck. Thanks to CK2Go for fast shipping and easy transaction. I will tell everybody. This is a great knife, especially for the price. Light, thin blade and extremely sharp. Easy to work with, it has become my go-to knife. Have been purchasing knives for my daughter for her new home. The Tojiro DP may not be the best choice for a newbie, but since they are so reasonably priced and take a great edge (at least for a while in somewhat abusive hands) they'll do until she improves her skills. Great knife for the price. Like the light weight and balance. Very sharp. I like it better than my Wusthof. 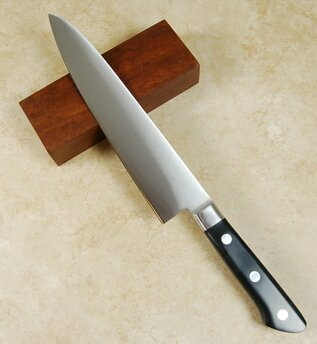 My sous chef and cooks are interested in purchasing a Tojiro after using my knife. Great knife. I bought it as a gift and am wanting one for myself. Arrived in great shape and in a timely matter. Was razor sharp out of the box. No complaints. This was a gift for my son. He was thrilled and used the knife many times before returning to New Zealand (home). We will make additional purchases as the need arises. Great service and a great product. thank you! excellent, sharp, light-weight, holds an edge. beautiful, SHARP, easy to use, affordable, need I say more?